A waitress at the Playoffs Sports Bar and Grill earned much more than tip money just because she heeded her husband’s advice to keep playing. Signorello used the last $10 she had to buy a 2-spot ticket for five draws. 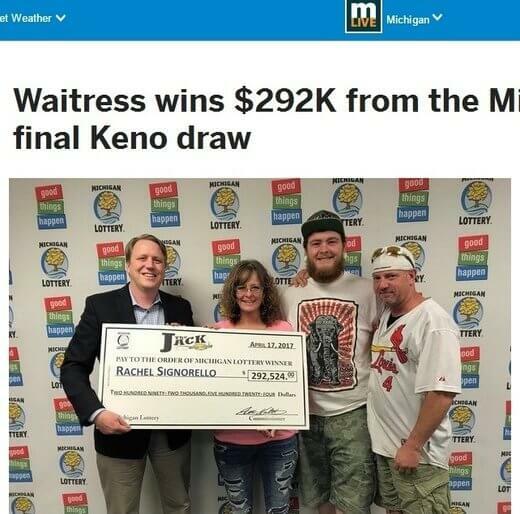 The first four draws were duds, but the last one won for her a Club Keno The Jack prize of $292,524 from the Michigan Lottery. And to think that she would not have played if her husband had not asked her to! When she re-watched the draw from the lottery website, people started congratulating her. She locked herself up in a bathroom to regain composure after realizing she had won. She now wants to pay off bills, buy a new home, donate to a charity that supports Huntington’s disease and save what’s left. As with most winners, she’s happy to be relieved of financial worries.